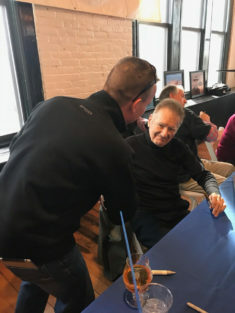 On Saturday, January 27th, “Two Roads Brewing“ (1700 Stratford Avenue Stratford CT 06615) celebrated the launch of “Igor’s Dream” Imperial Stout – and it wasn’t just about the beer – it was also about celebrating Stratford, Connecticut’s role in aviation history. 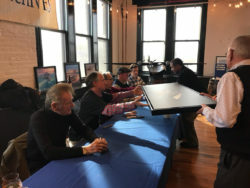 The family of Igor Sikorsky (The father of the Helicopter) – Son’s: Sergei and Nikolai Sikorsky, grandson Igor III, and Dan Schultz, President of Sikorsky Aircraft Company, were on hand to autograph 6th edition bottle labels and talk with customers. 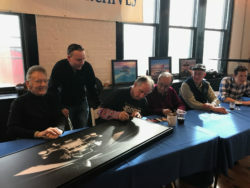 Squadron Poster’s customer Ray Miller of the “United Aero Group“ (www.unitedaerogroup.com) brought his Squadron Posters “CH-53E Jet Black Super Wide Canvas Print“ and had it signed. -Simply Awesome! 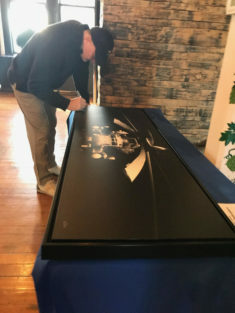 Dan Schultz, President of Sikorsky Aircraft Company, signs Ray Miller’s (of the“United Aero Group“) personal copy of Squadron Posters “CH-53E Jet Black Super Wide Canvas Print“. 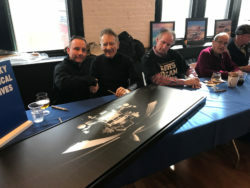 Igor Sikorsky Jr. son of the famous flyer (Igor Sikorsky) signs a Squadron Posters 60×20 framed “CH-53E Jet Black Super Wide Canvas Print“ for Ray Miller of the “United Aero Group“. 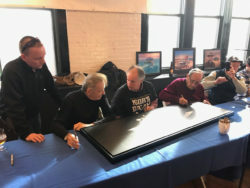 Nickolai Sikorsky, son of the famous flyer (Igor Sikorsky) at Two Roads Brewing Company in Stratford, Connecticut signs Squadron Posters 60×20 framed “CH-53E Jet Black Super Wide Canvas Print“ for Ray Miller of the “United Aero Group”. 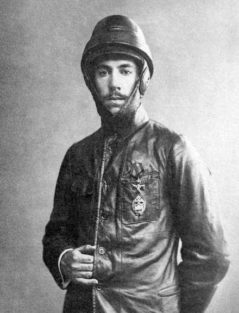 Igor lvanovich Sikorsky – “The father of the helicopter” (May 25, 1889 – October 26, 1972), was a Russian­-American aviation pioneer in both helicopters and fixed-wing aircraft. His is known as the first successful mass produced helicopter. Among his innovations in aviation, after immigrating to the United States in 1919, he founded the Sikorsky Aircraft Corporation in 1923, and developed the first of Pan American Airways’ ocean-conquering flying boats in the 1930s. In 1939, Sikorsky designed and flew the Vought-Sikorsky VS-300, the first viable American helicopter, which pioneered the rotor configuration used by most helicopters today. Sikorsky modified the design into the Sikorsky R-4, which became the world’s first mass-produced helicopter in 1942. His first success came with the S-2, the second aircraft of his design and construction. His fifth airplane, the S-5, won him national recognition as well as FAA license Number 64. His S-6-A received the highest award at the 1912 Moscow Aviation Exhibition and in the fall of that year the aircraft won for its young designer, builder and pilot first prize in the military competition at Petrograd. CH-53E Jet Black Super Wide Canvas Print by – Squadron Posters! 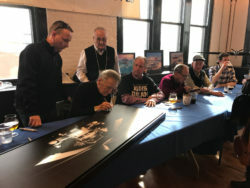 Post credit: Special thanks to Ray Miller, “United Aero Group” , Two Roads Brewing Company and Samantha Beaty of Squadron Posters for helping to preserve aviation history! This entry was posted in Affiliate Partners, Aircraft Posters, History, News. Bookmark the permalink.